I’m back with part 2 of the daily things that I carry in my purse. Be sure to read Part 1 so you can catch up on the other half of my purse. My sunglasses will never be left behind. My shades are a must for me. I am all for protecting my eyes since I only have one pair. I also do not like to be out in the sun squinting and eventually getting a headache from it. I suggest investing in a good pair of shades that you can wear daily and can go with whatever you are wearing. I know it’s easy to want to buy a pair that is trendy or different and I say buy those shades after you have covered yourself with a basic pair of black and brown. The keyword is ‘mint’ here. Don’t pack the fruity breath freshers they aren’t your friend. I know they taste really good but what if they don’t fight off your bad breath but brings more attention to it. Having something with a mint flavor a safer option. Having bad breath in a conversation is a huge turn-off. What can be worse than not having a tampon or pad when you need one. This is one of those times where a timeout has to be called in life to handle the situation immediately. I carry a tampon with me always rather I’m 20 or 2 days away from my monthly visitor. I may not need it myself but how quickly will I become someones new BFF when I’ve come prepared for their emergency. There have been plenty of times I have noticed that my hands, elbows, and legs are dry/ashy. That sounds like a lot of places but for the record, I do moisturize before I leave the house. During the cold season, you have to watch out for it even more. When using restrooms in the public, the soap and water always leave my hands feeling dry and even looking ashy. Having a moisturizer always comes in handy. A small pack of tissue can save you from everything above and many more situations. Just this week I needed one after grabbing a wet handle exiting a building. Ewwww!!!! Having a rollerball to apply on my wrists and neck is perfect for the days I forget to put on perfume before I leave the house or I know I’m going to be out late. I like to listen to music with everything that I am doing. I use public transportation and even with my long walks, I like to hear music. It makes my travel more enjoyable and the time goes by so fast. Also, I realized the importance of having a pair of headphones when traveling. They are perfect when I want to cancel out noise annnnnd when I don’t feel like talking to people. Hair ties, headbands, and bobby pins are good when you are out and about and need to pull your hair back. If you are going or coming from the gym hair ties are perfect to pull your hair back. Bobby pins are perfect for pulling back hair and giving a different style if you find that your hair is trying to stick up on your head. I know with short hair us ladies are very limited on styling and headbands are great for a change also. 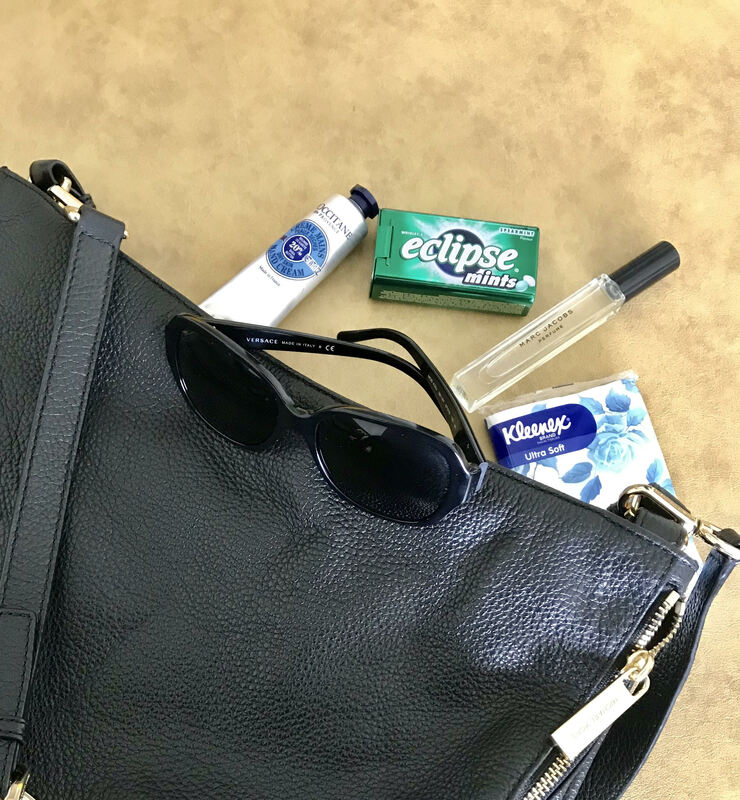 I am a woman who loves to carry a big purse and if you are the opposite than I suggest taking a look at part 1 & 2 and decide which items would meet your daily needs. What are some items that you have to carry daily?